Send your message in chocolate! 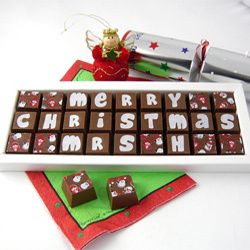 Chocolate text messages for all occasions be it Valentines, Diwali, New Year or Christmas we have it all. And guess what you can personalize it too with name on it. These are the best gifts for Mom, Dad, Sister, Brother and to your Love. Three magical words " I LOVE YOU " can melt anyone's heart and when written on chocolate makes it a ..
A sweet chocolate message with a lovely "I love you very much" message embossed on the delicious cho..
Give birthday wishes to your DAD with this unique chocolate message.It is a complete and tasty prese..